Here in this article, we have given some of the beneficial stress relieving and anxiety managing apps for the smartphones. Let’s have a look at Best Anxiety Apps or Stress Relief Apps 2019 that we have selected based on their features and user popularity, So have a look at complete guide discussed below to proceed. In our daily work schedule, we often leave in a condition where our mind is full of stress, anxiety and usually the distress is there. These are the things that the every working person do face at some point in the life. If you are the one who is suffering from the daily stress and anxiety then you might be finding some way to get rid of it potentially. While still if you are willing to take out the time for certain activities to manage the stress, you fail, the reason being you are not able to provide them plenty of time for those activities. Smartphones are one thing that you carry with you always, this gadget or the device is meant for the doing of tasks or the defined functions. This device certainly could even play as the stress reliever and anxiety managing device for you. You would now be thinking how this app could help to remove the stress and anxiety, but wait for guys, this is possible. By using some of the efficient apps for the purpose you would be able to definitely do that up. 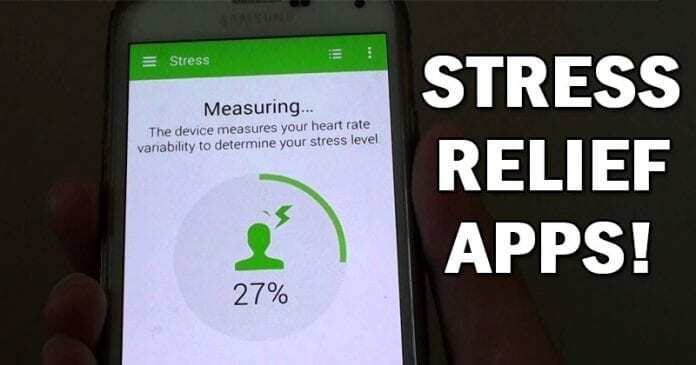 Here in this article, we have given some of the beneficial stress relieving and anxiety managing apps for the smartphones. If you are willing to know about the list of apps then please go and read the below article over down! This is the app which is designed and made by the professor of psychology and the neurosciences, he has made this app with the key point of relieving the stress and helping the users get rid of anxiety. All made with the methods gained through the clinical research, this app is focused to provide the best benefits to the users for the key point. There are some games inside this app which work in a wonderful way to get rid of the anxiety and the stress. One bad thing about this app is that the version of the app is only available on the iOS and not on the Android devices. So if you have any iOS device then good luck, you will be able to use this fantastic app! As the name of this app is focused on, you will be able to use this app for the main function of relaxing your mind and hence get the relief from the stress or the anxiety. This app has the documents and the instructions related to the ways of breathing in such a way that your mind gets relaxed the most. The detailed information for the effect of breathing on mind is also scripted inside this app and is conveyed in an easy to read manner. Again this is the stress relieving and anxiety removing app but this time in this app you will not get the information or the gaming but you will get the truly calming music designed scientifically and the images which will have the great relieving effect on your mind. 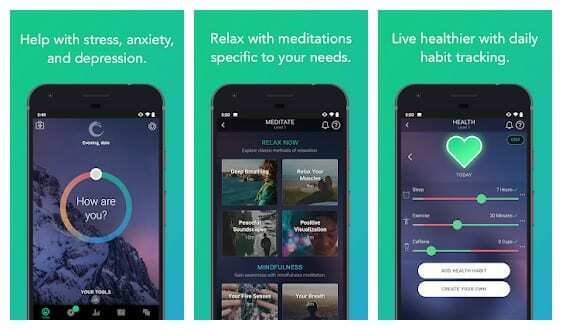 There is number of meditation tools inside the app which any user could use efficiently to get the best information so as to get rid of stress and anxiety. This is another app which is actually made by the psychologists and the expert computer scientists. They have managed to induce the excellent information for every of stress and the anxiety in which the person could indulge. The user has to figure out the things causing the stress and this app would provide the best-related information to get rid of it. This is the app which is available for both Android as well as the iOS platforms. This is the app where you will be asked to write down all of your stress causing issues, anxiety building things and then just let then forget those all. You have to make sure that you get to forget all of those causes and still if you are having this causes in you then this app will work to provide you with the statements and the workarounds to let those things be faded away. Simply make use of this amazing app and you shall be able to get rid of anxiety as well as the stress in an easy manner. Pacifica gives you psychologist-designed tools to address them based on Cognitive Behavioral Therapy, mindfulness meditation, relaxation, and mood/health tracking. Stress, anxiety, and depression are caused by an ongoing cycle of negative thoughts. Thoughts cause physical feelings and emotions which cause actions. Pacifica helps break this cycle using tools that target each of its components. How you feel matters. Whether you’re feeling stressed, anxious, depressed, or you’re dealing with constant negative thoughts, Happify brings you effective tools and programs to take control of your emotional well-being. Well, this is a full app which is very helpful to check out the stress level. Well, many online users found this app working and some are not. Stress Check is the most innovative tool available for quantifying your level of psychological or physical stress. By measuring your heart rate through the camera and light features on your Android, Stress Check can estimate your level of stress in real time. The Headspace app teaches you how to meditate and live mindfully. You can use it at work, at home or anywhere else. There are exercises on everything from managing anxiety and stress to breathing, sleep, happiness, calm and focus. Calm is one of the best apps for mindfulness and meditation to bring more clarity, joy, and peace to your daily life. Start your journey with a calmer mind with the app that’s trusted by millions. 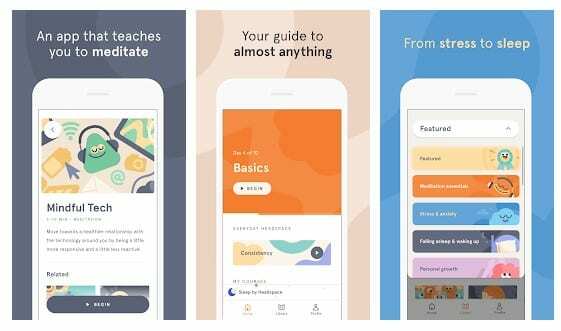 Calm is the perfect meditation app for beginners, but also includes hundreds of programs for intermediate and advanced meditators and gurus. What’s Up? is one of the best Android apps that can help you to cope with Depression, Anxiety, Anger and Stress. The app comes with a great interface, and it features 12 common negative thinking patterns and simple methods to overcome them. So, it’s an interesting app which you can use to improve your mental health. 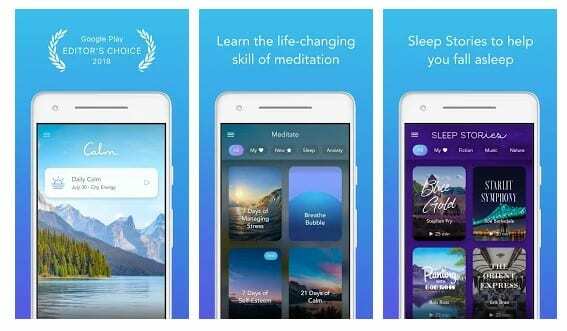 Twenty-Four Hours a Day is a premium app which features daily meditation techniques in written form. This app makes it easier for people in recovery from addiction to focus on sobriety wherever they are. 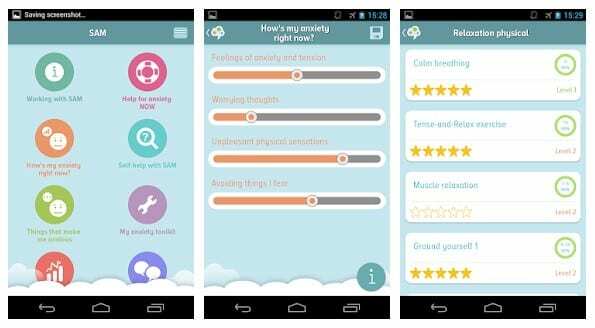 So, it’s another great Anxiety app which you can use on your Android smartphone. Struggling with anxiety? Tired of missing out? There are things you can do to stop anxiety and fear from controlling your life. 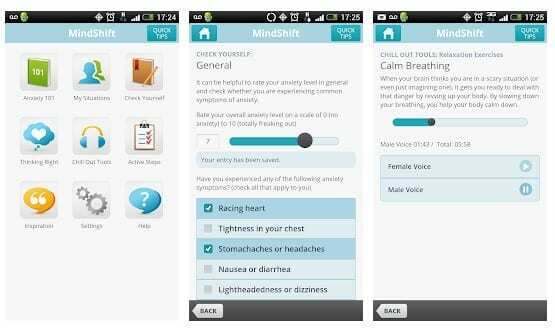 MindShift is an app designed to help teens and young adults cope with stress. It can help you change how you think about anxiety. Rather than trying to avoid anxiety, you can make an important shift and face it. The centerpiece of cognitive-behavioral therapy is changing your emotions by identifying negative and distorted thinking patterns. With this app, you can write down your negative feelings to analyze the flaws in your thinking and reevaluate your thoughts. iMoodJournal is another exciting lifestyle app which allows users to write down their ups and downs they face in daily life. The app helps users to keep notes of their overall well-being with editable mood labels. So, its one of the best Android app which you can use for overall mental health. 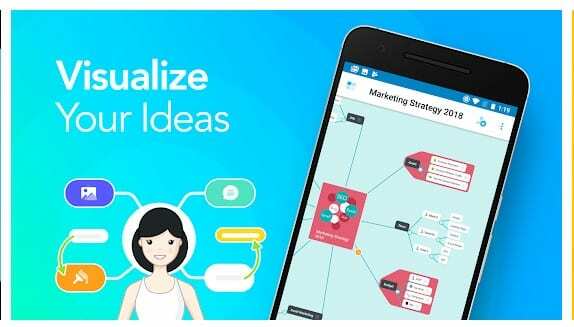 MindMeister is one of the best Android apps that you can use to give your ideas and thoughts a particular order or structure. It’s indeed a great mind mapping app which you can use to organize, prioritize and generate new thoughts. So, its indeed one of the best mind mapping app that everyone would love to have. As we all know, while we sleep, we go through different sleep phases. Normally, we miss the deep sleep that is much needed for everyday life. The person who doesn’t get a deep sleep or completes through all different sleep phases feels dull all day. So, Sleep Cycle alarm clock recognizes your sleep pattern by using some special sound technology and wakes you up in the right time. As we all know, in few studies coloring has shown some great sign of relaxing and calming effects. Colorfy features over a thousand different pictures that you can color. The great thing is that Colorfy works offline and it can help you to beat insomnia. Basically, it’s a color therapy app which you should use. Relax Lite is one of the great and unique stress relief apps that every Android users would love to have. The great thing about Relax Lite is that it has plenty of guided breathing and meditation exercises that use calming music to promote relaxation. 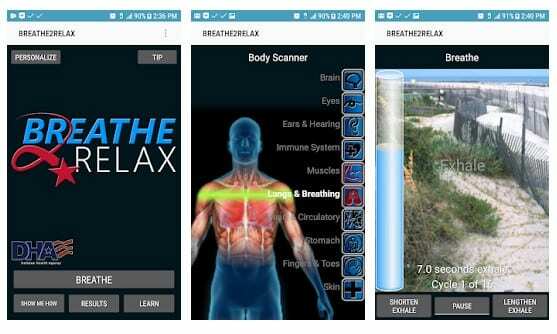 The app claims that the deep breathing guides provided in the app can reduce stress and other stress-related illness. 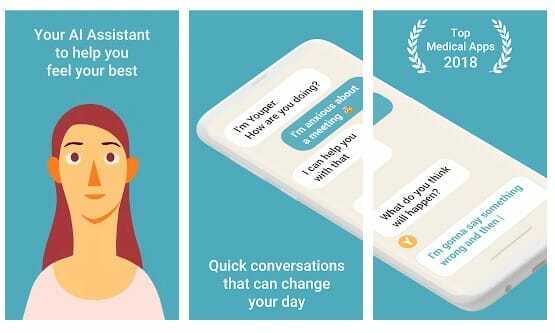 Youper is an AI assistant which is based on therapy and meditation. The great thing about Youper’s AI Assistant is that it can open up an insightful conversation that can help you master life’s ups and downs. The app helps users to detect and monitor emotional health symptoms, including anxiety, depression, panic, etc. So, Youper is another best Anxiety apps for Android that you can use today. So finally you have now got the apps that could be used for getting the relief from the stress and the anxiety you grasp in your daily life routine. If you utilize these apps in a proper way then it is sure that you could get rid of the stress and tension in a potential way. Hopefully, you would like this article as well as the information provided inside here. Please go and download the apps given in the post, do share this post with others if you like the apps written inside. Also, provide us with your opinions as well as suggestions regarding the post through the comments section below!at last, nevertheless, thank you for reading this article.